(CNS): South Asian region has very high levels of tobacco use, and thus not surprisingly, rates of non-communicable diseases (NCDs) and other tobacco related illnesses rage high. Nepal is in spotlight in South Asian region by demonstrating high commitment to tobacco control and also acting on the ground! Recognizing Nepal's leadership, the country was awarded the prestigious 'Bloomberg Philanthropies Award for Global Tobacco Control' at the 16th World Conference on Tobacco or Health (WCTOH 2015). Nepal received the Bloomberg award for advancing ahead with biggest-ever pictorial graphic health warnings on all tobacco packs from 15th May 2015. Beginning May 15, 2015, picture and text warnings must be placed on 90 percent of the front and back of all tobacco product packaging, among other strong measures for effective tobacco control. "Nepal Ministry of Health and Population had passed the comprehensive law comprised of large graphic health warnings, bans on tobacco advertising and sponsorships, and a smoke-free law all while facing immense pressure from the tobacco industry. During the process of passing the law and after its passing, the Ministry of Health faced 16 court cases filed by the tobacco industry but won with currently two appeals pending. Nepal is a leader in the South East Asia region for its tobacco control efforts" said Dr. Tara Singh Bam, a noted expert with the International Union Against Tuberculosis and Lung Disease (The Union). Firewall health policy from tobacco industry Another leadership Nepal has demonstrated not only in South Asian region but also for countries globally is by incorporating provisions in line with the Article 5.3 of the global tobacco treaty (formally called WHO Framework Convention on Tobacco Control - FCTC). This FCTC Article 5.3, is based upon the principle that there is a direct and irreconcilable conflict of interest between tobacco industry and public health policy. Dr. Tara Singh Bam said: As implementation of domestic tobacco control laws and global tobacco treaty is advancing, tobacco industry is indeed facing the heat. Not surprising, that the industry has sued governments when they have attempted to implement life-saving tobacco control measures. Nepal is no exception. With more than 11 law suits filed by the industry and its allies against the Nepalese government’s move to strictly enforce tobacco control laws, the Supreme Court decision favouring the government is a beacon of hope. It is important to underline that domestic policy to safeguard public health policy from tobacco industry interference was drafted not just by Ministry of Health and Population but by more than 15 ministries in Nepal in a series of consultative drafting sessions. "Tobacco control is a multi-sectoral response so we need to effectively coordinate with other ministries also, such as: Ministries of Information and Communication, Agriculture, Education, Finance (both departments of customs and inland revenue), youth and sports, Home Affairs, Health and Population, among others. We need to frequently meet these ministries to effectively implement tobacco control law” emphasized Dr. Bam. 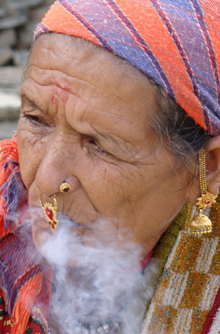 Now stronger tobacco control policies will come into effect from 15th May 2015 in Nepal. "We need WHO FCTC Article 5.3 to protect the current achievements that Nepal has made on tobacco control. We must not lose the gains made in public health and succumb to industry interference. Domestic policies in lines of WHO FCTC Article 5.3 will ensure that we continue to effectively implement and enforce the current domestic tobacco control law in Nepal" stressed Dr. Bam. Smoking and smokeless tobacco banned in public Nepal has taken a major leap by banning use of smoking forms of tobacco as well as of smokeless tobacco forms in public places. “Tobacco Control and Regulatory Act 2011 bans use of all forms of tobacco (both smoking and smokeless tobacco use) at public places. Public places include public transports also” said Dr. Bam to Citizen News Service (CNS). Let's hope Nepal's strong commitment to tobacco control despite industry pressure will mobilize other nations in the South Asian region and globally to accelerate implementation of gold standard tobacco control measures on the ground. Will recession impede TB care and control? Can South Korea Stop Drug-resistant TB Too? Why Should S. Korea Enforce Tobacco Treaty?